A year after the tremendous success of The Lord of the Rings: Fellowship of the Ring, The Two Towers will debut to a clamoring audience which was built upon a $300 million movie that was nominated for 13 Academy Awards®. Set to wrap up what will surely be the biggest year in box office history, The Two Towers is the second in a trilogy of films that is set to conclude in 2003 with Return Of The King. Already the big-screen adaptations of J.R.R. Tolkien's classic story have grossed $300 million domestically - a number that covers the production budget for all three films - and more than $500 million internationally. Filmed simultaneously over a span of 20 months in the beautiful country of New Zealand, the three films seem destined to collectively gross almost $1 billion domestically. 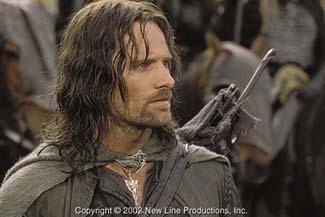 The second film will cover the travels of the broken fellowship, as Aragorn, Gimli and Legolas go on a search for the two kidnapped Hobbits, Merry and Pippen. Meanwhile, Frodo and Sam continue their journey to Mordor, in the hopes of destroying the One Ring by casting it into Mount Doom, all while meeting strange and wonderful new characters. Peter Jackson, the extremely talented director from New Zealand whose previous credits include The Frighteners and Heavenly Creatures, has said that the second film will be much more action-packed than Fellowship, which is quite scary considering the amount of action involved in Fellowship. The most impressive thing about Fellowship was its strong legs. As of early April, 2002, it was still playing in almost 1,000 theatres, and is consistently hovering around the top 12 films a good four months after release. Its first weekend-to-total box office multiplier is a solid 6.45, amongst the highest of the blockbusters released in the last four years. Comparatively, Harry Potter and the Sorcerer's Stone had a 3.5 multiplier, Monsters, Inc. had a 3.99 multiplier and Shrek had a 6.32 multiplier. Because of the fact that much of the film's money was made over a long period of release and not just during its initial weekend, there's a very good chance that The Two Towers will be a $300 million film, and it will most likely make considerably more than that.